All transactions are safe and secure with a reliable history in online purchasing behind each of our associates. 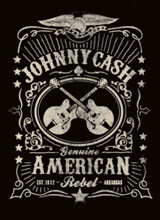 Buy the Johnny Cash American Rebel t-shirt to own Johnny Cash clothing and merchandise. In 1968, the iconic singer performed for the inmates at Folsom Prison in California. The legendary concert gave birth to one of the bestselling Johnny Cash albums, At Folsom Prison. Now you can commemorate the Folsom concert and all of Cash's great performances with this bestselling Johnny Cash Rebel t-shirt, which is perfect for fans of the artist and his albums. In addition to the Johnny Cash American Rebel tee above, browse the Johnny Cash Clothing Gallery for more apparel like men's and women's clothes, kids shirts or hoodies.